This site is deprecated: in other words, I’m not posting here anymore, feel free to use what you find but I won’t be maintaining it or posting here any longer. I’m sorry if some of the downloads and samples aren’t available, you can read my post from December 2011 (not coincidentally the last time I posted here) which explains a bit of the ugly story. You can read about why I made this change and I hope you’ll follow my new adventures at http://joelcochran.com (no WWW, which still directs to this site for the time being). As always, I thank you for reading. 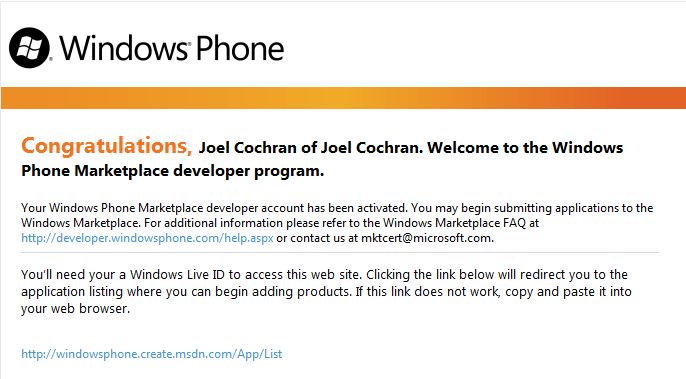 I have a confession to make: I have never built a Windows Phone 7 application. As a Blend and WPF guy who dabbles more and more in Silverlight, this may shock you, but time and work (not enough of the former and too much of the latter) have thus far prevented me from doing more than Hello World. Of course it does not help that stinkin’ Verizon does not yet have WP7, but hopefully that issue will work itself out soon. Since I’ve committed to writing an Appendix for Blend in Action that focuses on Blend for WP7, I figure it’s about time I got on the bandwagon and did some WP7 development. Since I already have Visual Studio and Expression Blend installed, all I needed to begin developing was to download and install the Windows Phone Developer Tools. This includes the Emulator and necessary WP7 project types. If you do not have Visual Studio or Blend on your machine, the free tools are part of this install. Since I plan to create and publish real applications I went ahead and created an AppHub account. There are a few things you should know before you get started. First, it costs $99 up front, so be prepared to pay it when you create your account. Second, you must have a Live ID. Third, you cannot create the account without a website URL. While this may seem trivial, it threw me off because I have not set up the website I intend to use for my Phone Apps yet. I went ahead and used this site with the expectation that I can change it later. The next thing that I did not expect was the requirement for a Gamer tag. I am not a gamer, I do not own an XBox, and I’m not entirely sure what a Gamer tag is, so naturally I did not have one to supply. I got stuck on the required gamer tag screen for a little while until I found one I wanted that wasn’t taken (theblendguy). The last thing that threw me for a loop was that as you are filling in the forms, all the copy is heavily XBox Live oriented. Once I got past the start screen, everything I read about the App Hub account was about XBox: there was no mention of Windows Phone 7. I thought about cancelling to make sure I had made the right selections but decided to stick to my guns, especially once I saw the price was correct. Sure enough, when all was said and done I had the proper account. I received a confirmation email and completed the account. As I understand it, the next step is for Geotrust to contact me and verify I am who I say I am. I love the fact that Microsoft is putting so much effort into verifying accounts and applications: in the long run it should mean a stable of quality apps, which the platform needs if it is going to thrive. The next thing will be application development. I have a couple in mind already. I plan to write about my experiences as I go along, so keep watching this space. The day after I created my account I received an email from Geotrust directing me to another site where I had to confirm my identity. Right off the bat, be prepared for some seemingly intrusive questions. I had to give them my social security number and optionally my driver’s license number as well as some lesser info such as birth date and address. Also, if you have been at your current address for less than two years you must supply the previous address. This information is the first step. Once you pass this stage, a second page comes up with a set of specific financial questions that theoretically only you should be able to answer. I received questions about my mortgage and car payment, including a couple of trick questions. The answers are multiple choice, so you are not providing them any specifics, and it doesn’t matter because it seems they know it all already anyway. Naturally, this was all done over HTTPS, so I wasn’t any more worried about security than I am when I use my credit card online. I was pretty amazed though at the BI that must be in place to develop the trick questions I mentioned. (And no, I’m not going to be any more specific). Overall the process was not onerous: I passed the verification and at this point I’m just waiting for my AppHub developer ID. I’ll keep you all posted. Now that I’m official I can start developing and submitting apps. Stay tuned! As I come to work this morning I recognize all the signs that Spring is officially upon us: I did not wear a jacket to work this morning, The Masters is over, and this weekend was the first installment of Philly Code Camp 2011. While I sacrificed being able to watch The Masters live to attend Code Camp this weekend, I was able to see it all thanks to the magic of DVR. As always, Philly Code Camp was fantastic: the Philly team is constantly setting the bar higher and higher and this time was no exception. I can only imagine the logistical nightmare of organizing and executing a code camp with almost 600 attendees, but these guys pull it off with flying colors! Have you never been to a code camp? Are you wondering what all the fuss is about? Check out this video posted on YouTube asking folks why they attend. Then, get off your duff and find one close to you and sign up! I had a full house for my session “Practical MVVM” and I truly appreciate the attendees: thanks for the nice notes and comments, if it helped you then it was all worthwhile. If you saw it, please post a review at SpeakerWiki. And remember you can download the Artifacts at http://practicalmvvm.com. The MEAP for Expression Blend in Action was updated yesterday to include Chapter 4, “Container Driven Design – understanding layout”. In the chapter I explain the methods I use to layout applications. There is a deep discussion on mastering the Grid container and heavy focus on making child elements greedy. For those of you who have written a book before I’m sure you understand the dearth of articles on the blog of late. It’s hard to imagine just how much work goes into a book length work. And no matter how many people tell you that ahead of time, you still aren’t prepared for it! The good news is that we are really in the thick of it now and things are going very well. My sincerest thanks to all the friends and supporters of the book, please enjoy the newest chapter with my compliments!